Have you ever wondered what it would be like to ride amongst wild horses and sleep out under the stars? Perhaps you enjoyed watching Western movies and television shows, but you still appreciate running water from a tap and the thought of a hot shower after a day in the saddle? 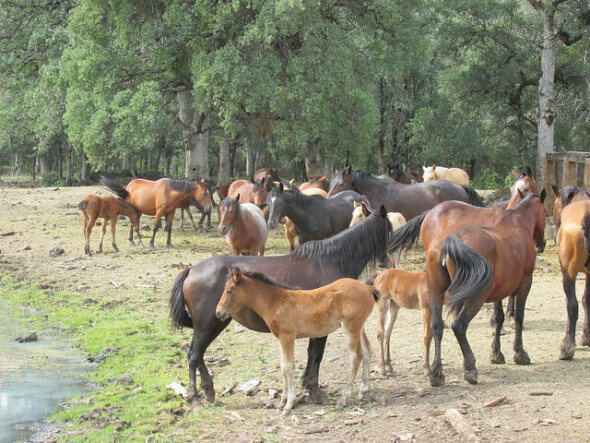 Fear not outdoor adventure seekers, Wild Horse Sanctuary in Shingletown, California offers the best of both worlds. Riders may keep one cowboy boot in the wild west, while the other is firmly planted around the creature comforts of a nightly campfire and morning breakfast served family style. 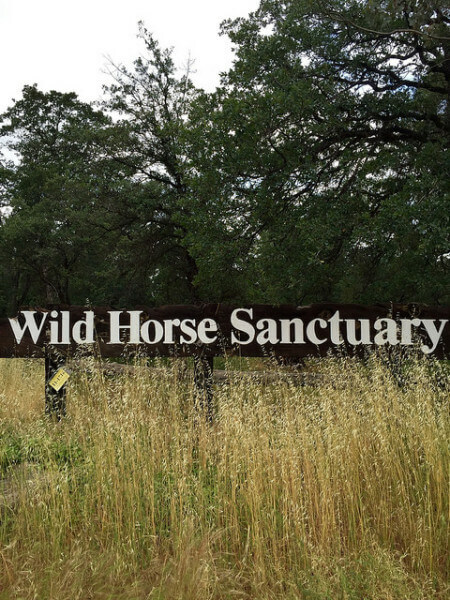 I discovered Wild Horse Sanctuary in Shingletown, California after a stay in nearby Redding. I had explored Burney Falls and wanted to step back in time, slow down and appreciate the natural beauty the Shasta Cascade region had to offer. I connected with my inner Dale Evans during a weekend observing wild horses in their natural environment. The fact that I was able to sleep overnight in my natural environment (on top of a real bed) appealed to my suburban upbringing. 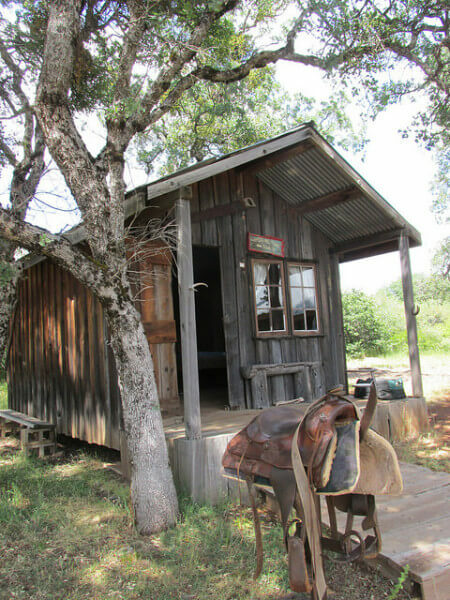 With five rustic cabins on property, guests are offered hot showers and flush toilets in separate stand-alone facilities nearby. Kids and adults will enjoy an evening barbeque with all the fixins and cocktails or cold drinks around the campfire. 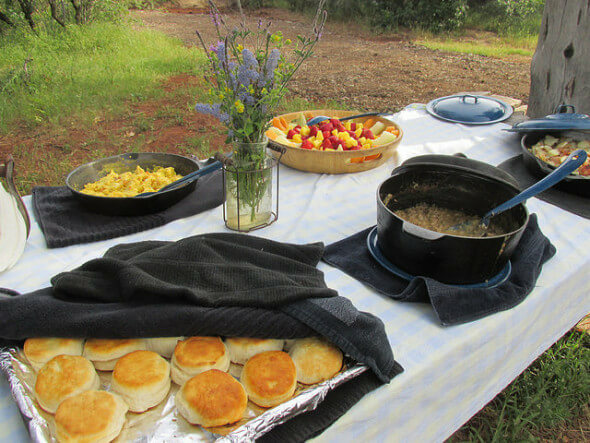 In the morning, expect a cowboy breakfast of fresh biscuits, homemade gravy, eggs, potatoes and fresh fruit. You’ll need to bring your own bed roll to the sanctuary, but a truck will deliver it, along with your luggage and gear to the base camp that afternoon. Dianne Nelson, founder of the Wild Horse Sanctuary took myself and a group of three additional riders, plus two guides, on an overnight horseback ride through some of the 5,000 acres the non-profit sanctuary owns. 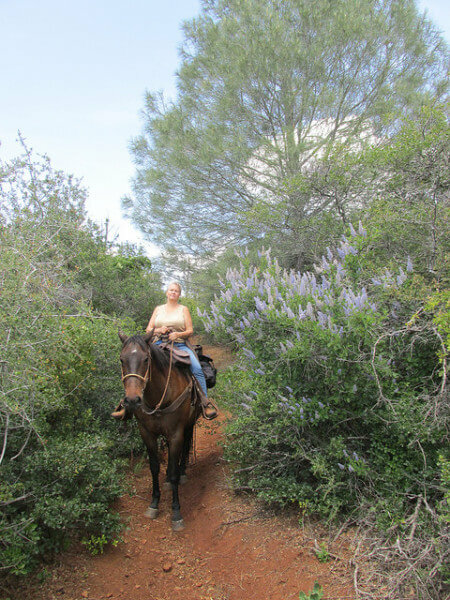 The Sanctuary offers two, three and four day rides, including wild flower rides in the spring, throughout the year. The two day ride costs $475 per person and includes lodging, one picnic lunch each day, dinner, breakfast and the horseback ride. The trail rides are open to teenagers and adults. Youth will need to have advanced riding experience as riders are expected to be able to mount and dismount and handle their horse with confidence. Having said that, we had two adults in our group with little riding experience and they enjoyed themselves immensely. The horses are gentle, well behaved and know the rugged terrain, but this is not a nose to tail ride. I loved every minute of riding with these majestic wild horses – and a few burros – during this cowboy weekend in Shasta county. Check the website for current pricing on overnight trail rides in Shingletown, California. Nancy D. Brown was hosted by Wild Horse Sanctuary. As always her thoughts, opinions and photography are her own.